A few days ago, I was trying to come up with something yummy to have for lunch and decided to whip up a quick batch of candied pecans. Since I was already starving, I chose to go the quick route (you can read a previous post about a slightly longer, equally delicious method for candying nuts here). I added a little oil to a small, heavy frying pan (I used walnut oil but safflower or canola would work equally well, I think) and toasted some organic pecans for a few minutes to add a little depth to their natural flavor. Then I added a glug of maple syrup, a few grinds of fresh black pepper, and a generous dusting of garam masala spice (I think ground cumin would work equally well.) I'm not going to provide measurements since it is totally up to you how much you want to use. 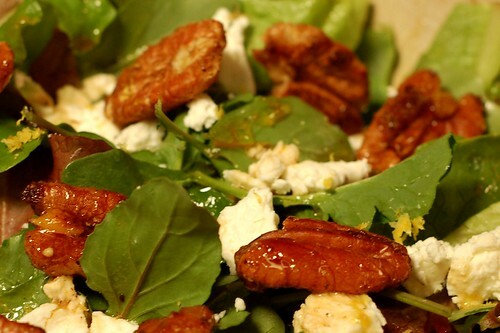 I let it all cook down for another minute or two and, voila, a batch of delicious candied nuts to add to my salad. 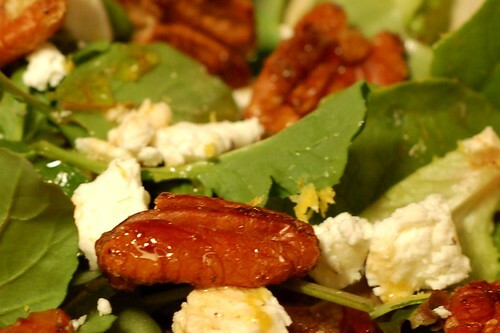 The salad was simple - baby arugla and lettuce with some goat cheese, the pecans, a splash of balsamic vinaigrette (just olive oil, balsamic vinegar, salt, pepper and garlic), and a little bit of zest from the skin of a mandarin orange I had handy to add a little bright citrus flavor. Yum! I find these nuts addictively delicious. They make any salad special (and are also good by themselves.) Walnuts work really well for candying, too. And you can play around with the spices and sweeteners to try out new combinations -- it'd be pretty hard to go wrong. mmmmmm. I'm gonna make some candied nuts right now, Eve! I was looking for something to eat for dessert. It's cold and snowy here and this will do the trick! And I was given a bag of pecans for Christmas and now I know what I am going to do with them!